Why Does the Wall Street Journal Hate the Web? Ever since the rear-guard at the Wall Street Journal won the battle to keep its news pages behind its subscription wall (although, its opinion pages are now free), they have been cracking down especially hard on anyone trying to breach that wall—even if those people happen to be paying subscribers. 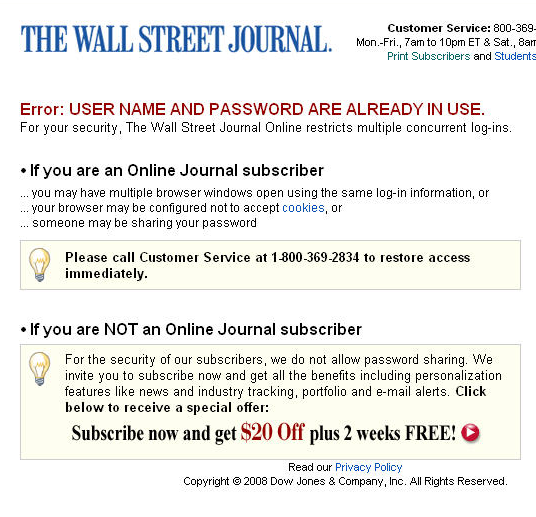 In what appears to be an attempt to discourage freeloaders, the WSJ.com is locking out anyone from its site when it detects more than one simultaneous log-in on the same account. But innocent, rule-abiding subscribers who may be using multiple computers, or doing nothing wrong other than forgetting to log out of their accounts, are being shut out as well (see email below). That is no way to treat your customers. In fact, it shows an utter disdain for how normal people actually use the Web. But it is an understandable, and classic, reaction. Incumbent executives always try to fend off inevitable disruption by blindly protecting their current sources of revenues. I liked Rupert Murdoch’s original idea of tearing down the entire subscription wall much better. Here is the e-mail I received from a paying online subscriber, describing his ordeal with the WSJ.com and a screen shot of what he saw when he was in breach of the multiple login rule. Hopefully, this is an isolated case. Otherwise, the WSJ.com could have a reader revolt on its hands of its own making. (If anyone else has experienced the same thing, please share in comments). I’ve been a paying subscriber of the Wall Street Journal online since 1995.
call in to get it reset. answering lots of questions. I tried email, but no response after 24 hours. policy to prevent subscription sharing. are actually preventing paying subscribers from easily using the service. Also, there are better technology solutions to the problem. I wanted to send a note in response to the earlier post re: WSJ.com subscribers. Our subscribers often use multiple computers to access their accounts; therefore, we’ve had a long-standing policy of allowing up to three concurrent logins in order to deliver the best customer experience possible. Customer satisfaction and service are of the utmost importance, and we regret any inconveniences incurred by this user.